Seven-year-old Tony has one choice…to live or to die. Tony Bruno just wants to fit in, but the bullies at his school are cruel and relentless. At home, he leans on his mother Teresa for strength and comfort, but she’s no match for his father, Carmen. His father, a fighter, and bully himself hates Tony. He is embarrassed by the child for not fighting back and wishes that Tony was never born. Then as a teen, in one-act of blind courage, Tony fights back shifting the balance of power with his peers. Even after Tony sets things straight with the neighborhood boys, his father continues to terrorize him. From the dark world, he lives in, Tony does unimaginable things to leave his unwanted life behind. 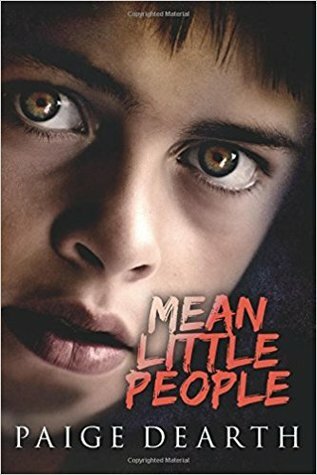 Mean Little People is not one of those books that start awful and ends up being all sunshine and flowers afterward. No, this is a story that starts off violent and stays violent the entire book. This is a story that will also break your heart because of the abuse Tony had to deal throughout his life. I will add a trigger warning to this book, so if you trigger easily, do not read the review. Like I said above, this book is very graphic. To be very honest, I almost DNF’d Mean Little People. I couldn’t take reading the abuse scenes and I will warn you, it does get worse. I can understand why the author chose to write the book the way she did. If she didn’t, you wouldn’t have empathy for Tony and understand how the events in his life shaped him into the man he would become. The bullying part of the book was very hard to read. As a mother, reading about this happening to a fictional child. I couldn’t understand why the adults in the book did nothing to help Tony. Actually, the only adults in the book that even came close to helping Tony were the bus driver and the drug addict. I was kept on edge during the book. I did wonder what was going to happen to Tony or what Tony would do from chapter to chapter. The author did a great job hooking me into the story like that. It was that reason why I didn’t DNF the book. I felt that if I did that, I would never see what Tony would make of himself. The fact that the author did make Tony have a love interest and that the love interest wasn’t put off by Tony’s issues or past (and my heart broke when he told her about his time in juvie). So when certain events happened in the book, I was a little upset by it. Actually, a lot upset. Because I truly hoped that she would become a huge part of the book. The end of the book was typical and I loved the revenge scenes. The quote “Do unto others” went through my mind as I was reading the book. I just hope that Tony for peace from what was done. Why: Honestly, it was the abuse scenes that lowered my rating. I understand that the abuse was a huge part of the storyline and that the author needed to make me feel empathy for Tony. But I couldn’t get them out of my head during the rest of the book.